Ziplines? Snow Tubing? More than Just Skiing at Traverse City's Ski Resorts! Ziplines? Snow Tubing? More than Just Skiing at Traverse City&apos;s Ski Resorts! Nicole steps off into space at Mt. Holiday. TRAVERSE CITY — Nicole Janiga’s face said it all. 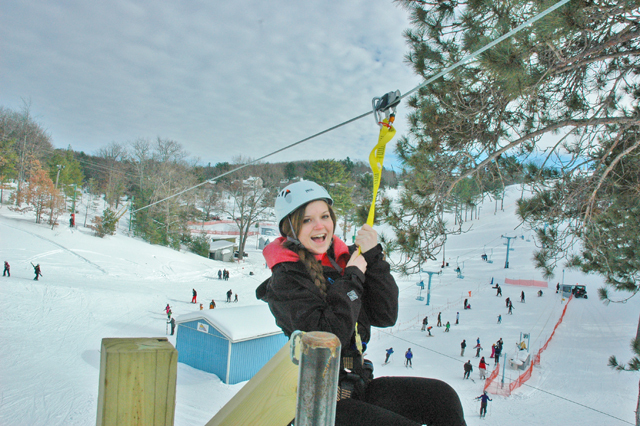 The Traverse City high schooler had just been buckled into a harness and swung out high over the snow on the new zipline at the Mt. Holiday Ski Resort, and she was already grinning. No shrieks or whoops as she sped along on her brief journey across the main Holiday slope, startling the skiers below her – just a giggle or two. The zipline is one of two (it’s 288 feet long, and there’s a 330-foot return line) installed just before the end of the year at Mt. Holiday. When spring arrives, the ski area will begin construction on what will eventually be a ten-station zipline network. In fact, this past year Mt. Holiday purchased a 12-acre parcel of land on the backside of the ski area where it plans to locate much of the new facility as part of a plan to make itself more of a year-round attraction. The ride costs $10 per person; reservations are required. Above the ski slope on the Mt. Holiday zipline. According to executive director Teresa Galante, it’s all part of a larger strategy that Mt. Holiday has been working on. 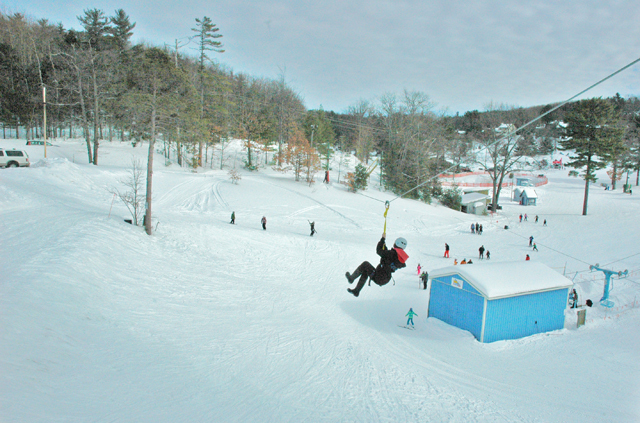 Started in 1949, the ski area (located just east of Traverse City on Holiday Road) was almost closed and sold off for development after 1999, but was acquired by a nonprofit group that has run it since 2002 as a community resource. Like its counterparts in the for-profit ski industry, it’s had to be creative in appealing to a wide variety of users. Not everybody wants (or knows) how to ski, after all. Take snow tubing, for instance. Mt. Holiday has been in the tubing business for years. 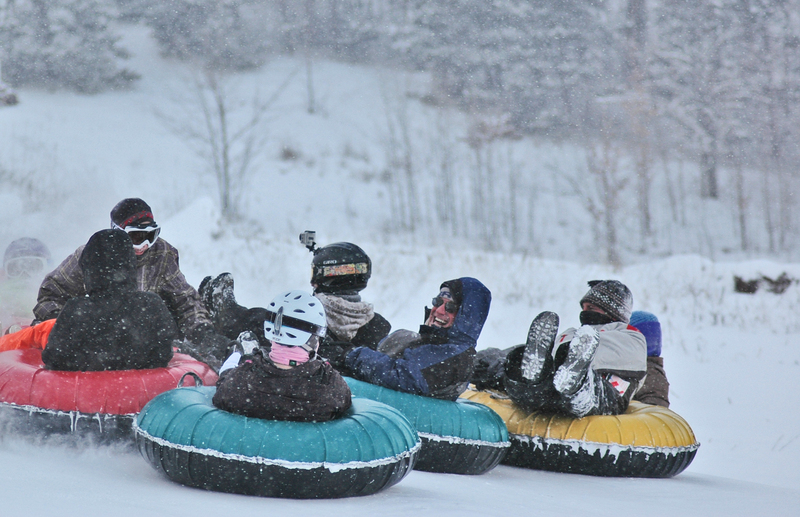 Tubing has all the thrilling speed of a toboggan run or a sledding hill – except that you get to sit in the middle of a big soft inner tube and ride down a groomed hill where there are people keeping an eye on you. And when you get to the bottom, there’s a towline waiting to take you back to the top so you can do it all over again. Tubing down in a group at TimberLee Hills. 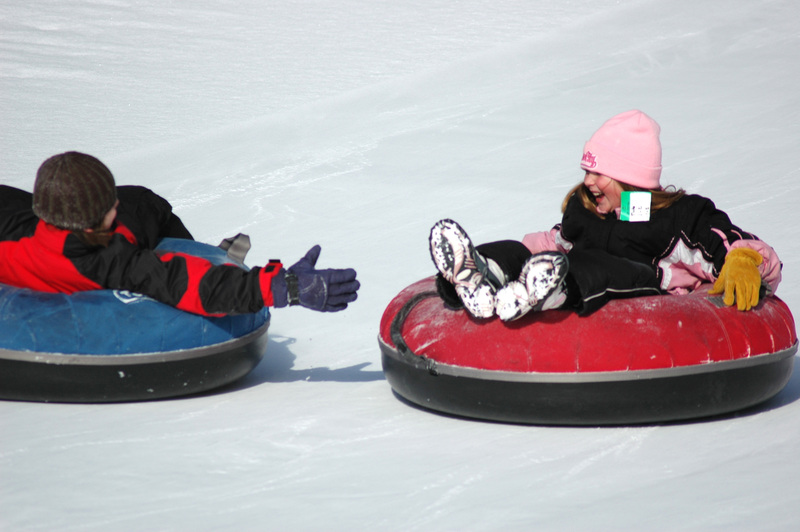 Small wonder, then that snow tubing is one of the nation’s fastest-growing winter pastimes. What other “sport” requires little more of you than the ability to sit down, hang on tight and do a little high-pitched screaming as you hurtle downhill on a large inflated rubber donut? Letting go at Mt. Holiday. Mt. Holiday’s dedicated tubing park is pretty steep, which appeals to a lot of tubers, and it has a mechanical lift – which helps you make the most of your allotted time. (These things are popular, especially on weekends and school snow days, so they can get busy!) But it’s not the only tubing hill around; in fact, the largest tubing hill in Michigan is just on the other side of town. It’s a former ski resort called TimberLee Hills, and tubing is pretty much all they do -- except for parties, weddings and other events in the lodge.Over in Bellaire, Shanty Creek Resorts has a sophisticated tubing park just above their Cedar River lodge, with eight lanes that have been sculpted into a series of gradually descending ups and downs. Tubing feels safer than sledding or tobogganing, to be sure. You’ve got all that soft air-padded cushion under you, after all. On the other hand, while you can aim and steer a sled (sort of) a slippery rubber tube is almost intentionally designed to spin around; as often as not, you end up going downhill backwards or sideways. Which does keep the snow out of your face. Lots of people like to lock hands and legs and go down in linked groups, which adds to the shrieking but seems to make the whole thing go a lot slower than individual tubers can travel on their own. Some tubing hills even have specially-designed two-person tubes that are particularly popular with families where there are small children.